Q. We would love to have the interior of our home painted professionally, but we have two birds. One is a cockatoo that we’ve had for 32 years, and the other is a parrot that we‘ve had for three years. I’ve done research on using low VOC paint, but I still don’t trust what I’ve read. We love our birds, but haven’t painted in the 18 years of residing at our home. We also have two dogs. A. As a longtime bird parent, you clearly know how sensitive birds are to even the slightest change in the air and environment, and are smart to ask questions about painting around them. The fumes from a freshly painted room can be lethal for your feathered friends. That’s because some of the most harmful chemicals in paint come from Volatile Organic Compounds, or VOCs, which are released into the air not just when you paint, but for several years afterward. Low VOC and No VOC (which is just super-low VOC) paints are good alternatives to regular paint because they reduce VOCs released into the air. But it doesn’t mean there are zero VOCs in the paint or that there aren’t other aerosolized toxins that can affect birds. 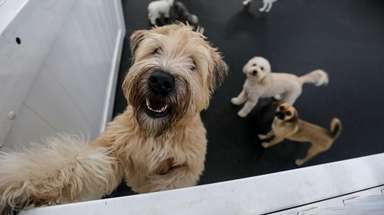 As for the dogs, you could keep them outside while you paint or board them as well so they don’t have to breathe in the fumes and are not underfoot while you paint. Dogs are not as sensitive to paint fumes as birds, but they should be treated with the same precautions you might have for a young child in the home. Q. My three dogs, Reesie, Captain Jack and Dobie, all eat grass. I was told the dog food I feed them is a good one. When I feed them, I add a little water to the food so it isn’t so dry. I do not let the food get soggy. I think, if they didn’t eat grass, they might not be able to poop. All three act like they are starving, but they do get enough to eat. I feed them twice a day. Are they missing something in their food that makes them want to be fed all the time and should I give them something to loosen their bowels? I have had dogs all my life. I am almost “older than dirt,” and I have never had a dog eat grass unless it wanted to throw up. Do you have any insights on this? A. Thank you for including your dogs’ names. I love to know the names of the pets I am trying to help. Nibbling on grass usually isn’t cause for concern unless Reesie, Captain Jack and Dobie are eating copious amounts of grass, and then vomiting. You mention they might need grass to poop, which may mean they are not getting enough fiber in their diet. Veterinarians say dogs need 2.5 percent to 4.5 percent fiber in their food. Ask your vet if the food you are feeding provides enough fiber. If you don’t want to change their food, you can add a little canned pumpkin, sweet potatoes or canned green beans to their diet daily to see if that helps. You also mentioned you feed them twice a day, but they always act like they are starving. Of course, some dogs treat every meal as if it’s their last and practically “inhale” their food. This behavior, however, also can lead to tummy troubles that may make them want to eat grass. If they are speed-eaters, buy each one of them a “slow food dog bowl,” which is designed with twists and turns to slow them down. Eating slower can help their digestion. 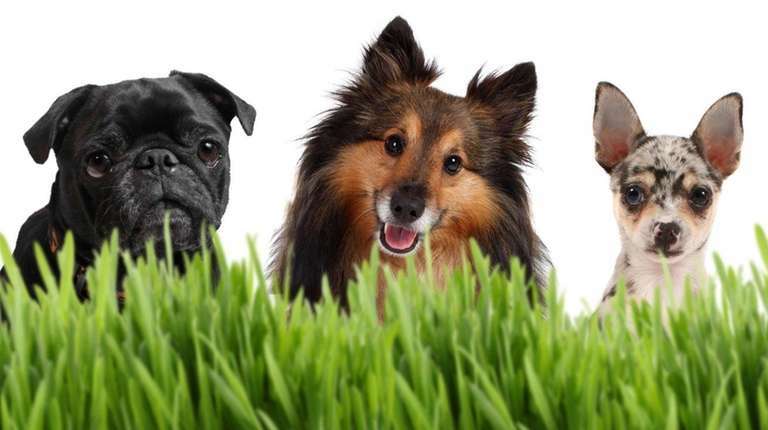 Finally, their grass-eating habits could indicate they all have intestinal worms. Take samples of their poop to the vet to rule out that possibility.